Actually, baked fish is not mine favorite dish, but as the whole family loves it, so it appears periodically on our table. In this case, it’s a medium-sized sea bass baked in the oven, but with a twist. In fact not even one. Clean and gut the sea bass. Then add salt, pepper and sprinkle with lemon juice. Cut the onions in half rings, chop the greens and stuff the sea bass with it. 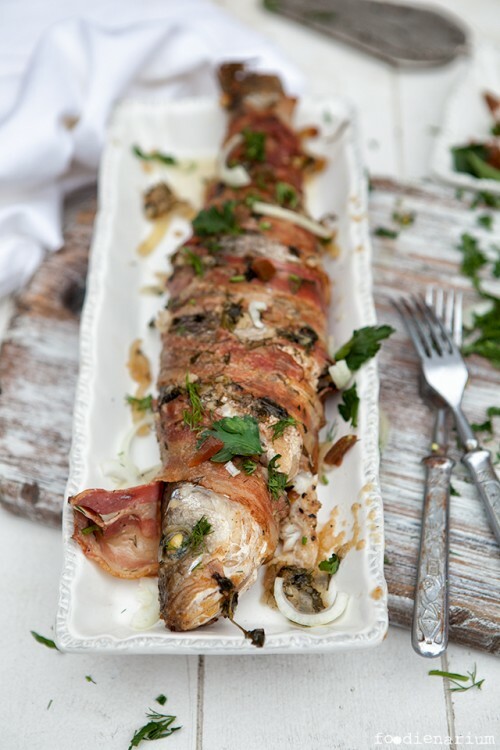 Wrap all the fish with bacon and fry in a little bit of vegetable oil in a frying pan on both sides. This is necessary so that the bacon becomes crispy. At this time, preheat the oven up to 180C (355F) (with convection). Next, tightly wrap the fish in foil and bake for 30 minutes. After this time, take out the package with fish, unfold and serve sprinkled with greenery.